It's the beginning of March, and we're starting to see some warmer days. Though I am afraid the snow isn't completely behind us, I think it is important to get outside and take a look around the yard. - Since we did have quite a bit of heavy snow this winter, take a look around and notice any broken branches in your bushes and trees. These should be pruned out come Spring, or a little later for some Spring-flowering varieties. - Get out your rakes and brush away leaves and other debris from the garden. You should be seeing Daffodils, Crocus and Hyacinth coming up. Cut back most perennials now if you haven't already done so. Spring is also a good time to cut back your Butterfly Bushes to about 12". - Make sure you're taking care of your garden's resident birds. Clean feeders regularly and fill with new seed. Clean out birdbaths and fill to a few inches with fresh water regularly. This is the first year I have really gotten to know the birds in my yard. I know that like clockwork, if I put out a suet cake, the Downy Woodpecker will come and feast. The Chickadees flutter to and from the feeder quickly, while the Tufted Titmouse lingers awhile in the branches close to the feeder. The Blue Jay yells at all the other birds from the ground, and it's always fun to watch the little black squirrel hanging upside down stealing the seed! Deer are becoming an increasing problem in our area. As both the human and deer populations grow, we are bound to run into one another. Don't despair! There are things you can do to prevent your garden from becoming a deer buffet. "Deer Out," a 100% organic alternative to deer fencing. It covers 1250 sq.ft. and will not wash off in the rain! In fact, the product lasts 90-120 days between applications. 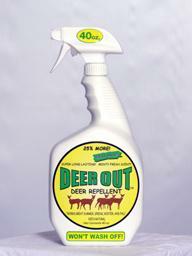 Deer Out can be used on all shrubs, trees, fruits and vegetables, and flower beds! Perennials are valuable for a wide range of uses in our landscapes. They beautify the home setting, increase property values, and provide for a succession of bloom and color. In addition, perennials are cost effective, unlike annuals, which die after one growing season, perennials grow anew from their roots each Spring. Given the right location and proper care, perennials can be used in beds, borders, rock gardens, woodlands, meadows, and container gardens. Choose your plants according to their intended growing positions. Is the site wet, dry, shady, or sunny? Many plants will thrive in various situations and some need specific conditions to thrive. Invest some time in studying your area before planting. Our labels will provide you with much helpful information. Most perennials prefer a good, weed free, well drained soil which is able to maintain moisture. Most prefer a soil pH of between 5.5 to 6.5. For those that prefer a more alkaline soil, lime may be added. For those that prefer a more acid soil, sulfer may be added. Dig the soil to a depth of about 12", or more if possible. This will give the roots plenty of room to grow. You can now incorporate bone meal, or other fertilizers (if you wish) at the manufacturer's recommended rate. Container- grown perennials may be planted anytime the soil is workable, from early spring to early fall. Carefully remove the plant from the container and plant at the same depth it was in the container. Firm the soil around the plant to remove any air pockets around the root-system. Water the plants thoroughly. It is best to mulch all plantings especially for their first winter to minimize any damage from frost heaving the plant from the soil and drying the roots. Water when necessary, especially during the first year of establishment. Once established, most plants require about an inch of water a week, either from rain or irrigation. It is best to irrigate early in the day to allow the foliage to dry before dark to reduce the incidence of disease. Mulch to retain moisture loss, prevent weeds, and to keep the roots cool. A good mulch is bark or wood chips. If you need to stake any of your plants, it is best to do so early in the season before the plant is actually damaged by falling over. If your perennials seem to be losing vigor in their centers, it is probably time to divide them. This can be done by using a shovel or spade and cutting the plant in half. This division is best done in the spring when growth is evident, but the plant is not too large. Keep your climatic zone in mind when planting perennials. We live in Zone 7 on Long Island. The library has a wealth of information about perennials, and don't hesitate to ask your local grower for information. Providing the best home for your perennials is the most important step to ensure their survival.